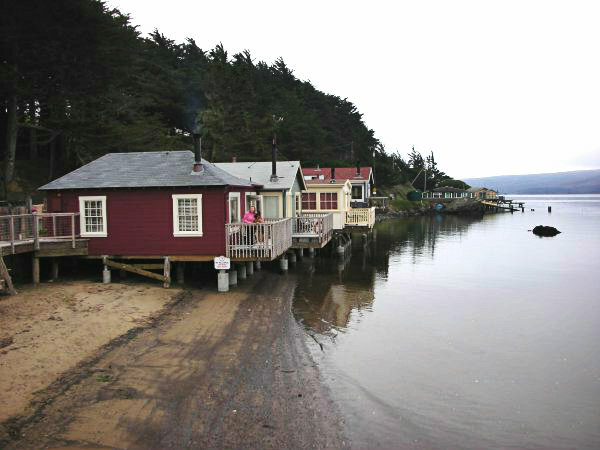 An hour north of San Francisco is a small grouping of cottages located in Marshall, CA called Nick’s Cove and Cottages. These are a small settlement of 12 unique cabins built mainly in the 1930’s, some on land and 5 on pilings over the beach of Tomales Bay. These are a charming group of cottages with vintage accessories scattered about and they evoke the feeling of a by-gone era. The area is quiet, tranquil and calming. It is the perfect place to relax, unwind and reconnect with yourself. Located right off of Highway 1, five of the cottages sit on pilings above the beach at Tomales Bay, and the remaining are located across the street scattered on the hillside. In the early Twentieth Century, the property was originally used for the tradesmen in the area and then turned into lodging after the construction of the Golden Gate Bridge which started attracting tourists to the area. See history (here). 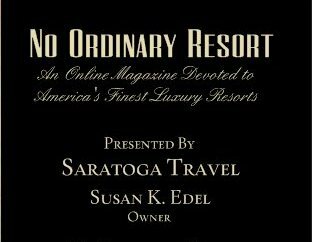 In approximately 2005, a multi-million dollar renovation was initiated on the cottages and restaurant bringing it to its current glory. Since it’s such a quaint property, the check-in process is simple. During my check-in, I was informed that the restoration of the cabins and restaurant were the vision of restaurateur and designer, Pat Kuleto, whose iconic restaurants include Boulevard, Farallon, Jardinière and Fog City Diner in San Francisco to name a few. I have stayed in the InnKeeper’s cottage and Ruthie’s cottage. Ruthie’s cottage being my favorite as it is one of the five cottages located on pilings over the water (see burgundy cottage above). This cottage is also an end unit giving a little more privacy and open feeling. Upon entering the cottages after the check-in, there is always a beautiful amenity of local cheeses, crackers and grapes awaiting my arrival. I was immediately drawn to the warmth and homey feel of the cabin. This cozy cottage offers a sleeping area with a bed made up so plush you just want to bounce on it, a nice sitting area with a soft leather sofa positioned in front of a wood burning stove, and a little kitchenette area with a small dining table. The bathroom is nicely designed and has heated flooring. There is an outside deck where I cherished waking up early and drinking my coffee in the still of the morning with the bay in high tide and running underneath the cottage. I felt like I was floating on water. In the evening, the soft sound of splashing water lulled me to sleep. All the cottages have been maintained to preserve the original simple and rustic architectural style, yet, the interior of the cottages are all about relaxed luxury. The cottages all offer similar amenities as mentioned above and each cottage boasts it own private deck or patio from which to watch a gorgeous sunset. Although rustic in feel, the cottages offer all the modern conveniences found in a hotel such as a plasma TV and wi-fi internet access. In-room spa services are also available, and feel free to bring Fido as Nick’s offers pet-friendly cottages along with freshly baked healthy treats for your best buddy. 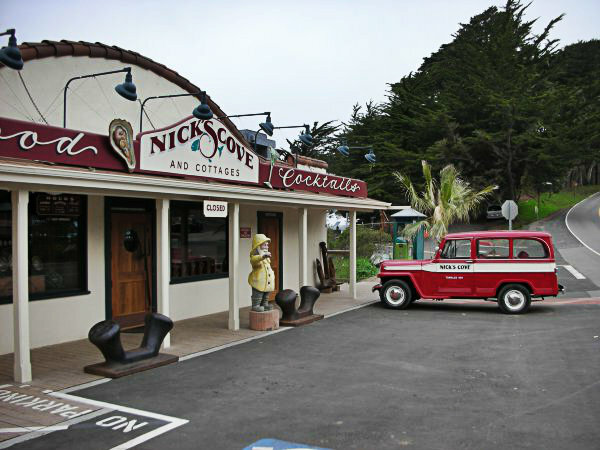 Nick’s Cove Restaurant and Oyster Bar is located on property and offers award-winning, farm-to-table cuisine. The ingredients used are sourced from local dairy and produce farms, and fresh seafood from the local waters. The restaurant has the feeling of a comfortable hunting lodge, offering casual elegance and a sophisticated wine menu to accentuate the fine meals. If your schedule does not allow for an overnight stay, this is still a fun place to come for a meal. There are several unique aspects about this property. This is not a chain hotel or row of look alike cabins sitting on a property. Each cottage is individually unique in both its architecture and interior design. Each of the cottages are designed with different accessories such as fishing rods, canoe paddles, stuffed fish wall plaques, and one even offers a nautical theme design ~ the Nicolina cottage. The feeling is more reminiscent to staying at your favorite, rich Aunt and Uncle’s cabin than staying in a rented room. 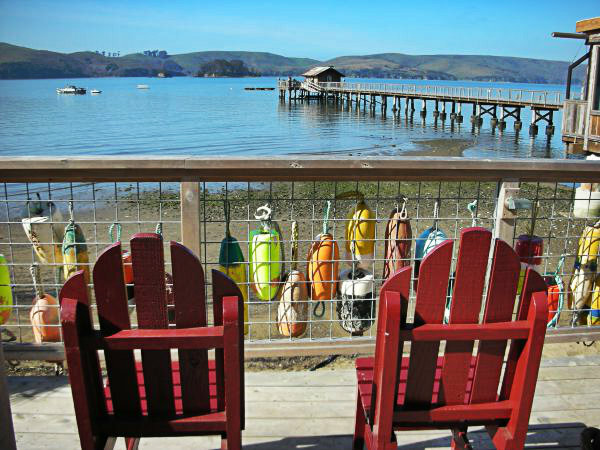 The most unique aspect of this property are the 5 cottages that sit on pilings over the Tomales Bay. It’s quite amazing to watch the tide slowly roll in under the cabin and completely consume the beach area until the cottages feel like they are floating on water. It’s a very serene feeling. 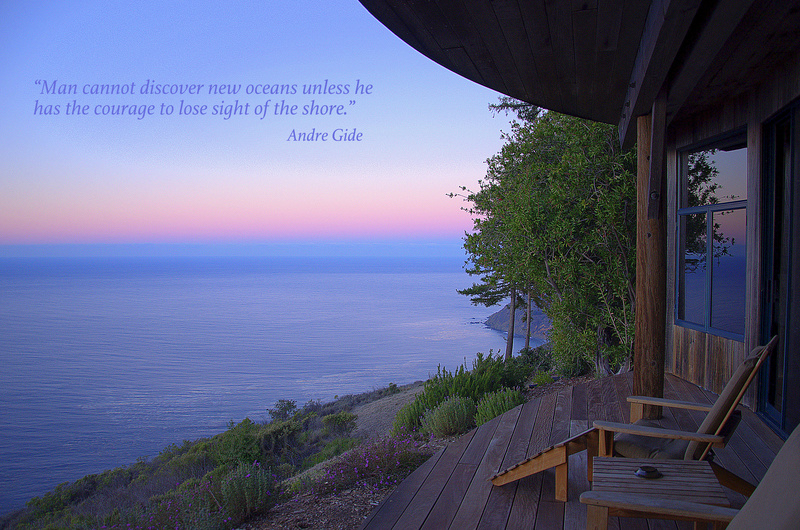 The beauty about staying at the cottages is that you can hunker down and just enjoy a good book or head out and visit one of the many local attractions such as Point Reyes National Park, Bodega Bay (most famous for the filming of The Birds by Alfred Hitchcock), Muir Woods, or Stinson Beach just to name a few. While you are out and about, be sure to visit The Marshall Store, an oyster bar and deli, off of Hwy 1 for a great local experience. There are numerous other outdoor activities available (see here). I brought my own kayak (there are rentals in the area) and paddled on the Tomales Bay. I say this as a word of warning because, even though I consider myself a fairly experienced kayaker, do be careful when kayaking in the Tomales Bay in front of Nick’s Cove. It can be quite calm and inviting in the early morning but the tide swiftly changes and creates a strong undercurrent that can be very rough and difficult to navigate. This is the only area that has ever given me a bit of a fright. It’s a wonderful area to kayak because it has a lot of wildlife to see but is definitely best tackled very early in the morning hours. Nick’s Cove Cottages is without a doubt a hidden gem and well worth the visit which is why I feel it’s worthy of being featured on No Ordinary Resort.